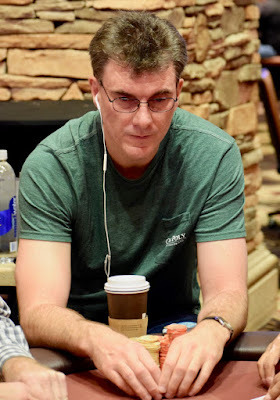 Paul Richardson started the final day of the NorCal Classic Main Event as chipleader, and he's adding to his stack each hand played so far today. Richardson has moved in once on the river and once on the turn - pushing Dave Larson off hands and capturing chips in the process. Richardson has added about 80k in the first 15 minutes. Michael Peck (26) and Jeff Spruitenberg (25) were eliminated in the first few hands.